Story Teller fans rejoice! One of our favourite characters, Timbertwig, is back for more adventures, fun and laughter in an all-new book by original writer and illustrator, Peet Ellison. That’s right, after more than 30 years, we are invited back to Wiggly Wood for a long overdue reunion with Timbertwig, Granny Knot, Abigail the Spider, and all their curious and amazing neighbours. So how has this wonderful development come about? In 2015, Ellison posted on the Story Teller group on Facebook to ask members from all over the world if they would like to see more adventures from Timbertwig. The response was overwhelmingly positive and so Ellison approached South African publishers Human & Rousseau which published Storieman, the Afrikaans version of Story Teller back in the 80s, as well as the successful series of Storieman omnibuses which reignited interest in Story Teller a few years ago. The rest is history – Timbertwig was (re)born! Timbertwig’s New Adventures (ISBN 978-0-7981-7150-2) was released in July 2016 in both English and Afrikaan. It comes in soft covers, roughly A4 in size with almost 100 pages. The icing on the cake is that it also comes with an audio CD with the four new stories being narrated by a celebrity – just like the good old days! Let’s get the disappointments out of the way first. The book is not strictly speaking a Story Teller publication and so you won’t see the colourful and familiar Story Teller logo anywhere on the cover. This also means that neither the iconic Story Teller jingle nor the catchy Timbertwig theme features anywhere on the CD. In fact, there is no music or sound effects in the audio at all, not even that magical “ping!” to indicate the need to turn over the page. The audio is simply the narrator reading the stories, unaccompanied by the tunes and sounds that brought life to the stories in the 80s. Perhaps most disappointing of all is that George Layton does not return to read the new stories. Instead, we have South African celebrity Susanne Beyers providing the narration. As already mentioned, the book consists of four stories. If you think four is not a lot, rest assured that you will not feel short changed. Each story has about 25 pages each, compared to the original adventures in Story Teller which had just five pages. The lengthier format allows fuller scene setting, greater character development and deeper exploration of life in the Wiggly Wood universe. Ellison speaks true: flick through the book and you could almost believe that you were back in the 80s as you see familiar characters come alive again in Wiggly Wood. It’s rather like going back to your primary school and seeing all your old friends again, or being transported back to your old neighbourhood and seeing the newsagent where you used to buy your copy of Story Teller every fortnight. Prepare to smile and perhaps even cheer as you meet familiar faces like Muddle the Mole, Tippy Toad and the Tickling Trees. I have to say, however, that I was disappointed not to see Down-in-the-Dumps Dennis who is my favourite character after Timbertwig himself. The illustrations are bright and colourful as you would expect. Ellison’s charm and wit shine through every drawing and they are sure to win Timbertwig a new generation of fans. The writing, while slow paced in some places, retains Ellison’s tried and tested recipe for adventure, with ingredients that include a dose of magic from Abigail’s wand, several spoonfuls of mischief from Timbertwig, and a handful of retorts from Granny Knot. Expect the expected: Abigail’s magic spells still go wrong, Granny Knot is still cantankerous, and Timbertwig still goes out of his way to help friends old and new. But the book also gives us fresh insights, such as insights into Timbertwig’s school life and there’s even a hint of a lovelife! We have waited 33 years for Timbertwig and his friends to return and now that they are here, it’s as though they have never left. 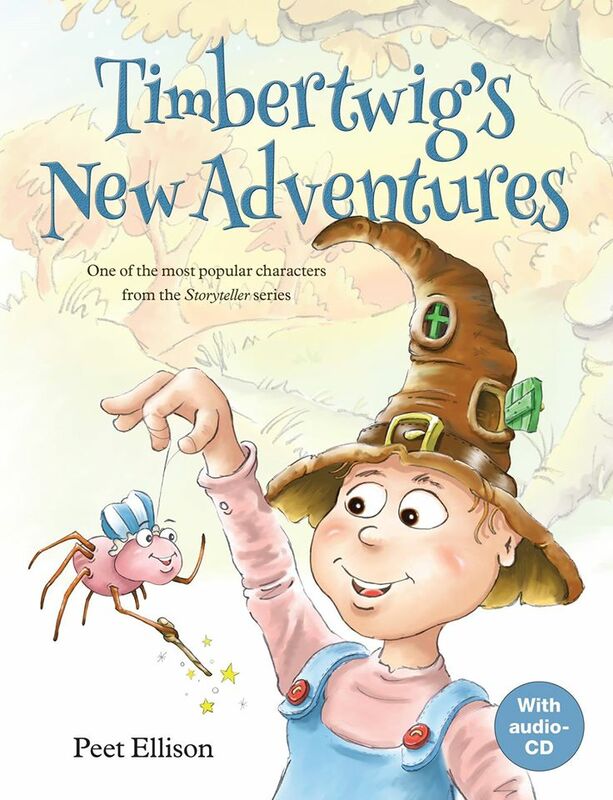 Timbertwig’s New Adventures is the most significant release since the last issue of Story Teller was published in 1984. It is unfortunate that it is currently only available in South Africa but Ellison is hopeful that it will be available in the UK (and other countries) in the not too distant future. It is certainly worth the wait, and it is everything that every Timbertwig fan could wish for. Well … perhaps not everything. Now I wish for more adventures from Timbertwig!